Kansans can’t wait to celebrate fall. Between corn mazes, pumpkin patches, hot apple cider, and gourds galore, there’s never been more to see, experience, and do to ring in the new season. Get in on the harvest cheer with a visit to these wonderful pumpkin picking spots in Kansas! 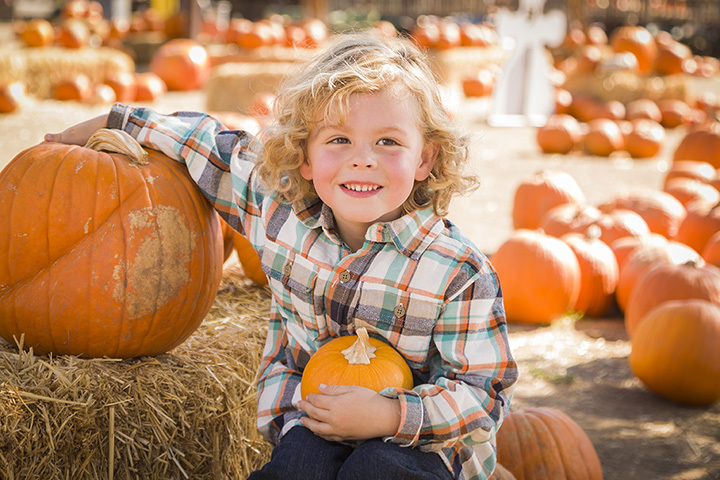 Kerby Farm in Bonner Springs, Kansas aims to be your destination for family fun this fall. Starting in late September, visitors can peruse the maze, enjoy a hayride, and pick out the perfect pumpkin from their patches. Keep in mind: only cash and checks are acceptable forms of payment. Louisburg Cider Mill may be known primarily for their homemade cider, but their pumpkin patch is nothing to sneeze at, either. From mid-September through the end of October, pick up your all-encompassing ticket to enjoy a 10-acre corn maze, hay wagon rides, live music, farm animals, and access to their 10-acre pumpkin patch. Mr. Gourdman’s describes themselves as “a one of a kind patch isolated away from traffic in a natural setting on a 15-acre lake, at a working horse ranch.” If you want to have the full farming experience, separate and away from everyday life, Mr. Gourdman’s is perfect. Find pumpkins of all different shapes and sizes throughout the patch. Powell Pumpkin Patch is right on the Louisburg/Kansas City border, making it a convenient destination for people in both areas. Starting on the last Saturday of September, Powell opens their doors every day from 9 a.m. until 6 p.m. The pumpkin patch covers over 30 acres with nearly endless options. Schaake’s Pumpkin Patch has been a Lawrence staple for over 40 years. They pride themselves on charging no admission fee and offering free parking, free hay rides, a free maze, free playground, and more. Find your ideal pumpkin from among their 30-acre patch of red, pink, and orange pumpkins. Opening day for Sunny Side Pumpkin Patch is at the end of September. Their goal remains the same as years past: “to let families and children experience a real home-grown pumpkin patch in a rural farm setting.” The patch has 30 varieties of pumpkins and almost 50 varieties of gourds to choose from. In order to access Walter’s Pumpkin Patch, you’ll need to pick up a general admission ticket ($10 on a weekday and $13 on weekends). We recommend going for the season pass, which will only cost you $26 for the entire year. With your general admission pass, you’ll get access to the daytime corn maze, hayride, games, and pumpkin patch. Wood Farms Pumpkin Patch in Pittsburg, Kansas is a family go-to destination year after year. Children love visiting the petting zoo and picking their own pumpkins from the large field. Call ahead to make sure you know which animals will be present and which types of pumpkins are available. Granny Mae’s pumpkin patch began as the owner’s grandmother’s land investment all the way back in 1942. Today, the pumpkin patch resides on that land, which they see as a tribute to her. Granny Mae’s offer six unique pumpkin patches, including Munchkin Land, SuperFreaks, Lands of Giants, Gourd Grove, Full Moon Farm, and the Pumpkin Patch. You’ll find every kind of pumpkin imaginable and a few you haven’t imagined, too. Britt’s Farm in Manhattan, Kansas offers “the most unique pumpkin in the neighborhood,” according to their website. Their selection of pumpkin and gourds is practically unrivaled. Make sure to call in ahead of time to ask about what new features they’ve added for this year!